A lot of folks are getting excited about the chance to show who’s the best big crappie or big bass fisherman on D’Arbonne this spring. While fishing isn’t anywhere near “good” right now, it will be by the end of the month. It should be just right for when the Louisiana Hunters for Heroes, in conjunction with Bayou State Crappie Association,. is planning a fishing trip for about 20 Disabled Veteran’s from around the state at Lake Darbonne. 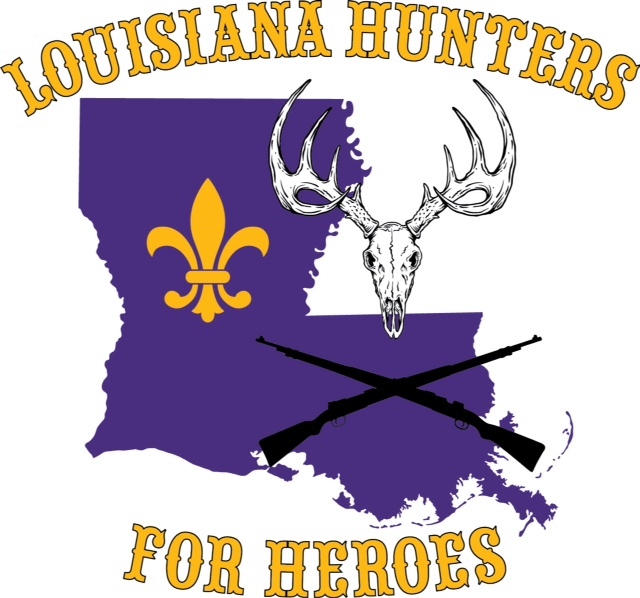 The Hunters for Heroes trip is scheduled for March 20-22. The Vet’s will stay at Lake Darbonne Sate Park where the cabins were donated by the state park system. The Bayou State Crappie Association in conjunction with the Chamber is having the King of Kings fishing tournament on Darbonne March 21st from 6am-2pm. The weigh-in will be at 2:30 at the new Darbonne Pointe, located just off Hwy. 33 on the west side of the bridge. All Vet’s will be participating in the event with a guide. All boats having a Vet in the tournament will be marked with an American Flag. At the weigh-in, Hunters volunteers will be cooking burgers and dogs near Ludwig Marine after the weigh in for the veterans and everyone interested in coming out. For more info on the Vet’s activities, contact Donnie Vocker 318-278-2909 or Brandon Jennings for the Tournament 318-533-9259. The tournament: Vets will be just a few of the ones participating in the tournament. Anyone can participate in the King of Kings tournament. 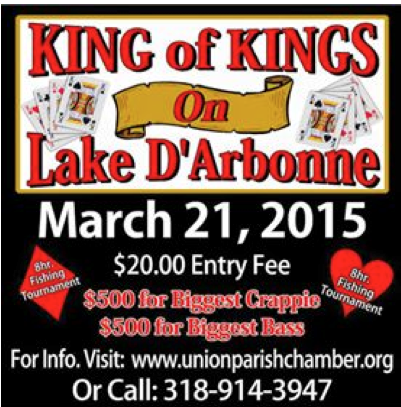 The Bayou State Crappie Association in conjunction with the Union Parish Chamber of Commerce will present the King of Kings Tournament on Lake D’Arbonne. All you have to do to win is catch one fish! Of course, it has to be the biggest fish of the day. This is a Single Fish entry, Single Pole Event. This is also a Combo Tournament Crappie/Bass, each having a Single Payout of $500.00 for the Largest Fish of the day for each. In addition your $20.00 ticket will also go into the D’Arbonne Expo Drawing on March 28th for another chance to win $500.00.